A scarce separately issued example. Coast Chart No. 21 From Sandy Hook to Barnegat Inlet New Jersey. 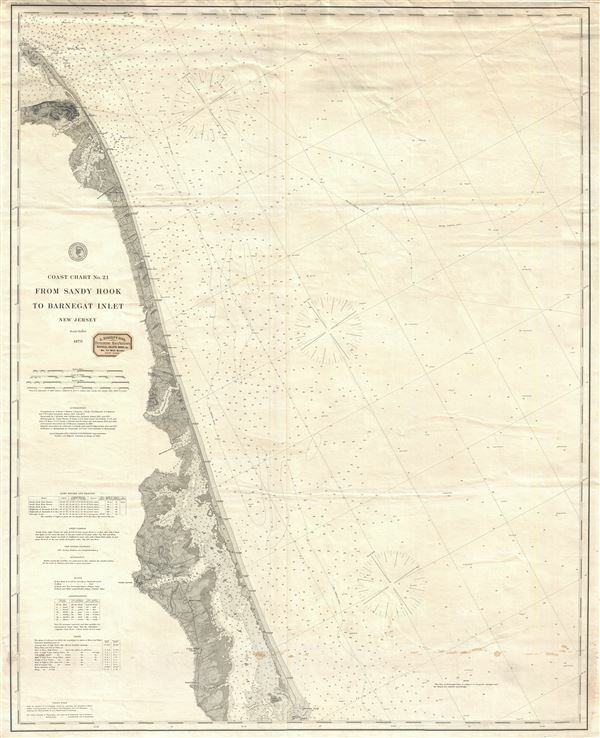 An uncommon 1879 nautical chart or maritime map of the New Jersey coastline between Barnegat Inlet and Sandy Hook. The chart offers countless depth soundings and a wealth of practical information for the mariner as well as superb coastal detail. The map identifies the course of the Long Branch and Seashore Railroad as well as various seaside communities, including Long Branch, Deal, Asbury Park, Ocean Grove, Spring Lake, Seagirt, Squan Village, Lavallette City, Seaside Park, Toms River, Motts Corner, Cedar Creek Village and Forked River, among others. Issued in 1879 under the supervision of Charlile P. Patterson, Superintendent of the Coast and Geodetic Survey. Represents coast chart no. 21 or 121. Later issues of this map were presented as a series where, this being the upper of three sheets, however, this present example is an independent issue. It is noteworthy that this is the heavy stock copperplate issue of this map, not one of the later economically mass produced electrotype issues. The original pressmark is visible all around the map. This map was originally sold by 'D. Eggert's Sons, Chronometers Manufacturers Nautical Charts, Books, and Co.' located at 74 Wall Street, New York. The remarkable D. Eggert pastedown is still present just under the title. Good. Some creasing and soiling, else clean. Original seller's paper stamp appears near title area. Stanford University, Branner Earth Sciences Library, G3811 .P5 1892 .U4 SHEET1.